1.Begin by ensuring your tea light holder is both clean and dry. TIP: Ensure to keep the brush strokes going in one direction to achieve a neater look. 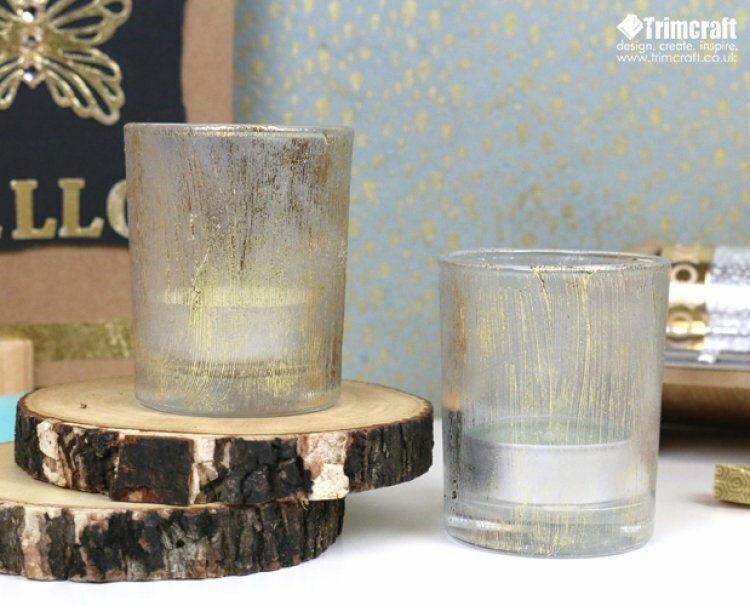 3.Carefully apply your First Edition Gold foil to the tea light holder, silver side facing down. Use a small piece at a time and dab the foil across your holder. Allow to dry. 4.Add another layer of glue to the tea light holder and repeat the above steps, this will allow you to intensify the gold colour. Leave to dry. 5.You will only be able to hand wash your tea light holders otherwise the foil will peel off. We have used this technique on a tea light holder but why not go bigger and use the First Edition foil on lanterns or a vase! We have more foiling inspiration on our youtube page, check it out here!